I needed a card for my father-in-law and this paper and the current Seize the Birthday challenge were perfect. 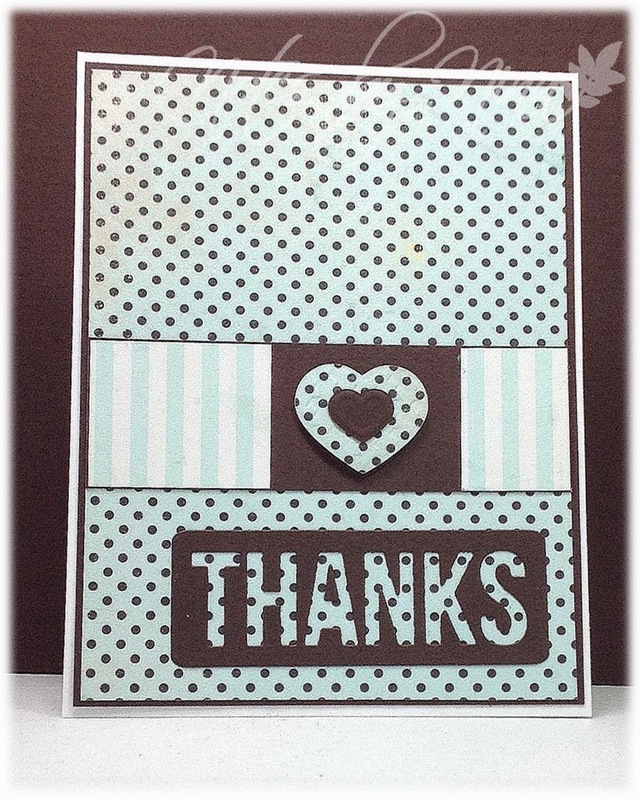 I used a chevron punch to separate the layer, and then added a tag from the paper pad and popped it up with foam tape. 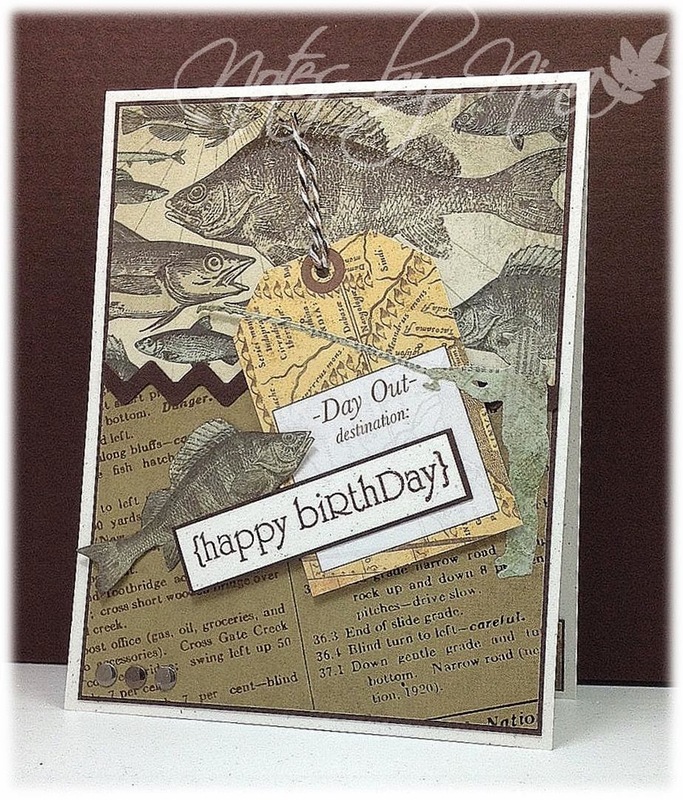 I used a die cut for the fisherman and fussy cut the fish. I added a little twine and metallic embellishments. 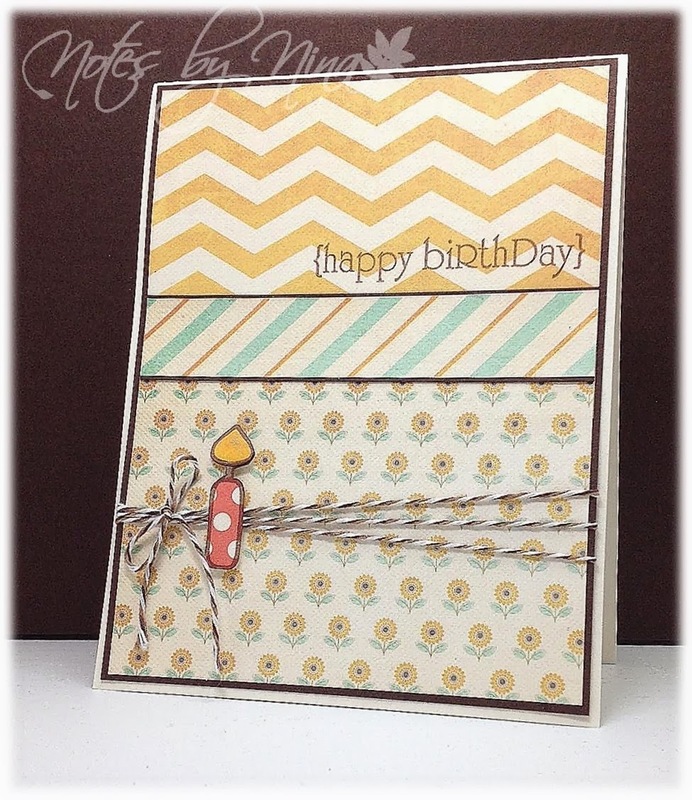 Supplies: Natural white and brown card stock, Designer Paper – Kaiser Craft, Papertrey Ink – Birthday Wishes, twine and metallic embellishments and chevron punch. Boy am I tired, but I wanted to get this card finished and posted before I drop for the evening. I used simple layers, added a sentiment that is popped up with foam tape and some embellishment that were created with punches circles and finished with a pearl. 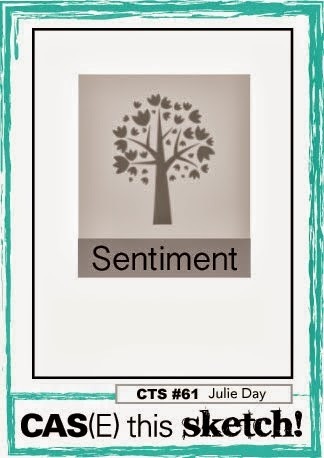 I created this card for the current Cas(E) this Sketch but then realized I screwed it up with my sentiment but I will add it to the gallery anyway. 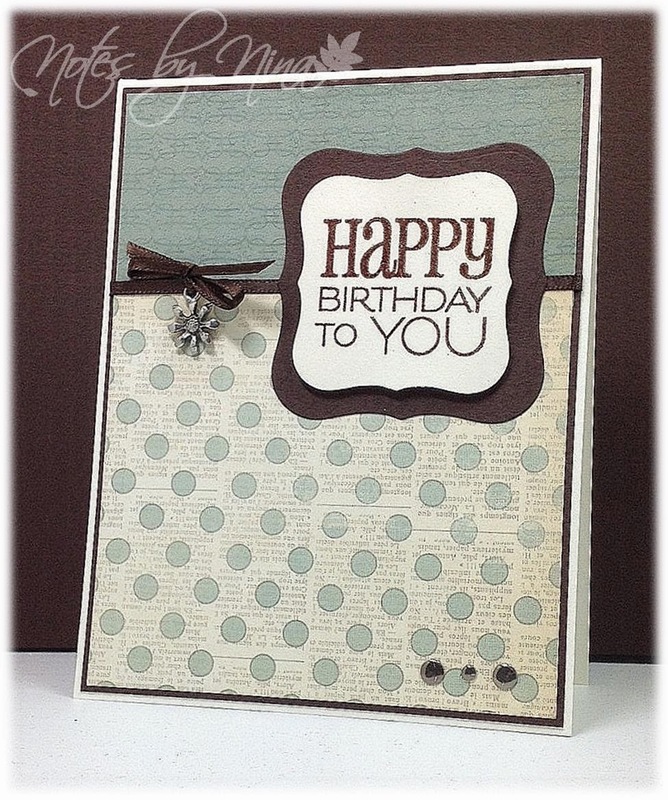 Supplies: Tan and brown card stock, Designer Paper – Basic Grey, Papertrey Ink – Birthday Wishes, twine and pearls. A quick second card, I wanted to make a monochrome card so I put this together while watching the Hunger Games J.
I used simple layers, Spellbinders created a perfect frame of the sentiment and I used foam tape to pop the panel up. I added some scrap ribbon in behind and fussy cut some small flowers and popped them up in random spots. I finished with some gems in the center of them. 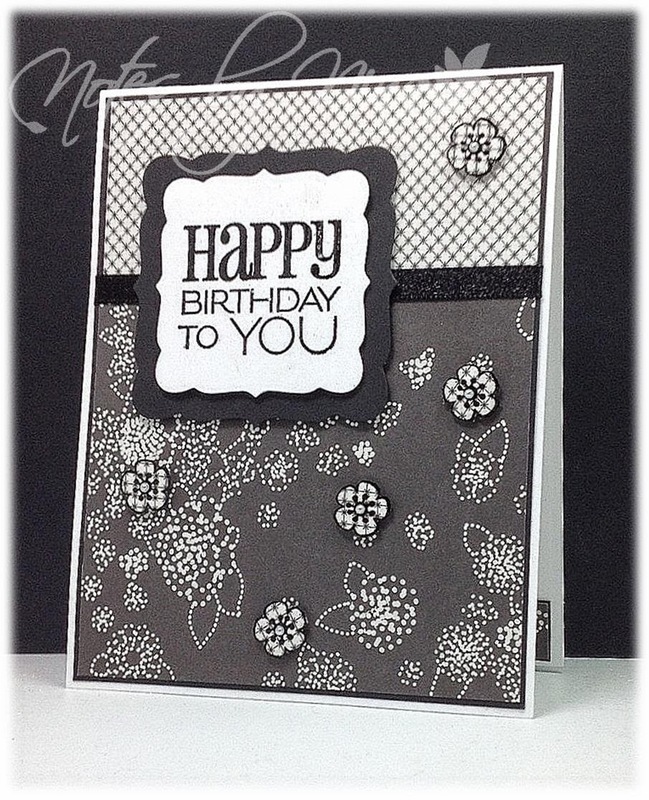 Supplies: White and black card stock, Designer Paper – Making Memories, Verve – Birthday to You, Spellbinders die cuts, ribbon, gems. I am combining two card challenges with this card; the first is for the current Card Concept Challenge where we are to use texture. 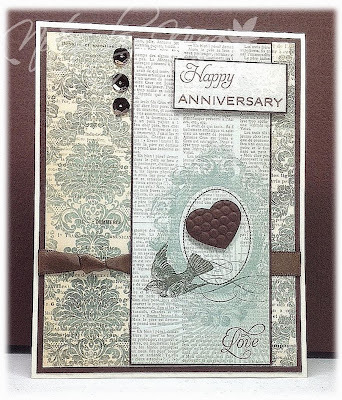 I added texture to the background with an embossing folder, I think this style falls under Clean and Layered. The second challenge is for Cas(E)this Sketch. I was determined to use this double-sided paper and have had it out on my desk for days. I created the daisy panel first then created a second one with the back side of the DP. 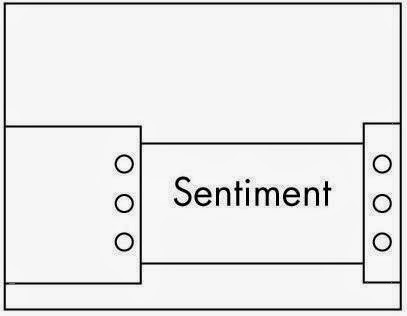 I finished with a sentiment. 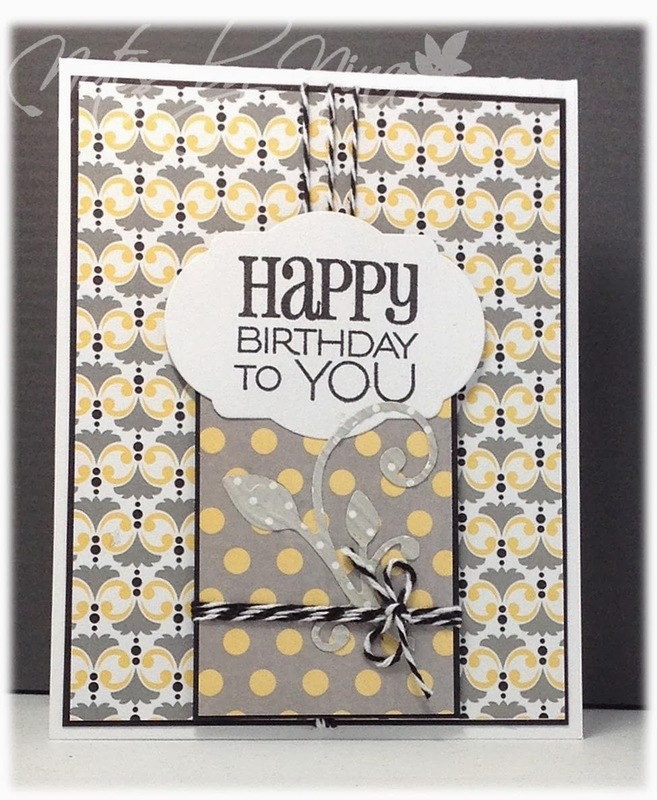 Supplies: Cream and brown cardstock, Designer Paper – Basic Grey, Verve – Birthday Bots, Craft Individuals-Daisy. 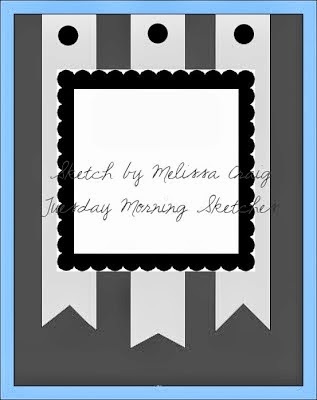 I have a quick card for the current Tuesday MorningSketches. I used simple layers for this card. I heat embossed the sentiment then used a die cut for the shape, I also popped it up with foam tape. I added this cute little daisy charm and some silver embellishments to match. 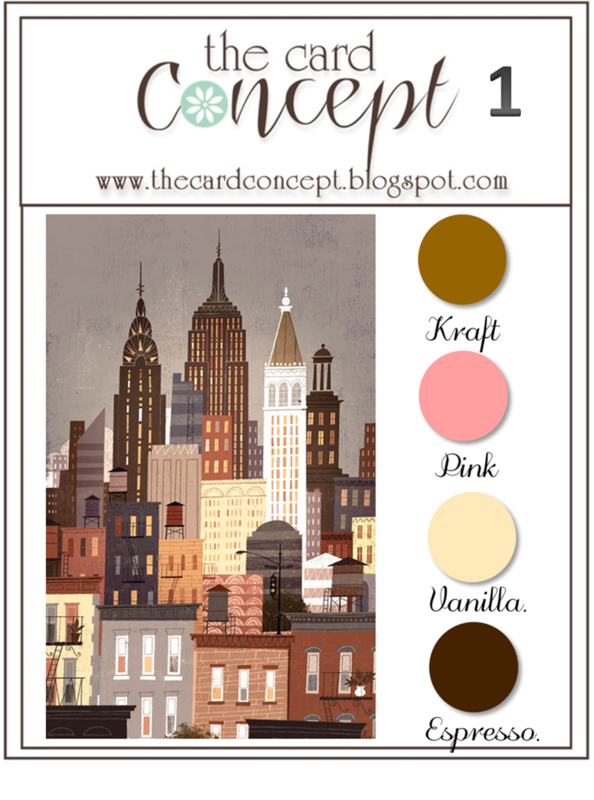 Supplies: Cream and brown cardstock, Designer Paper – My Mind’s Eye, Verve – Birthday to You, Spellbinders die cuts, ribbon, misc charm, silver embellishments. It is time for a new Merry Monday Christmas Card Challenge. 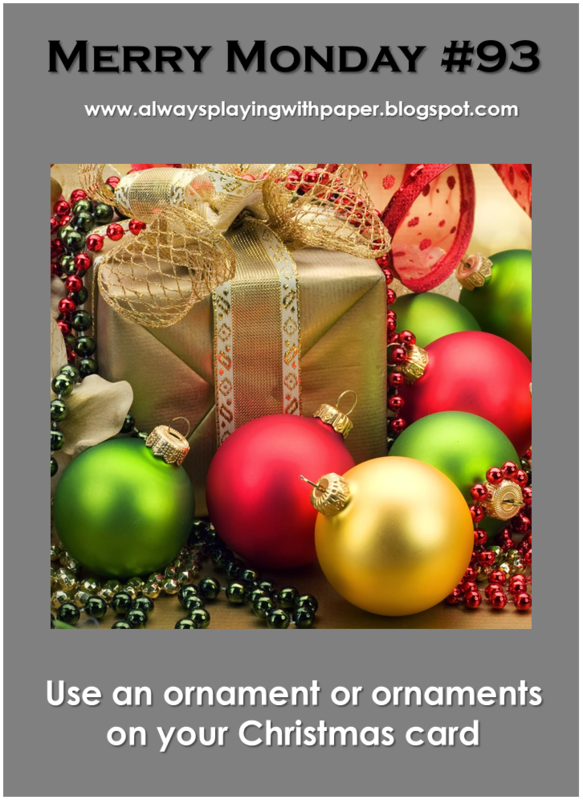 This week the challenge is to use an ornament or ornaments on your card. I added some texture to the top panel and popped it up with foam tape and I used Spellbinders dies to create a small frame. 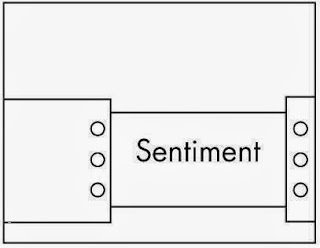 I heat embossed the sentiment for a little added elegance. 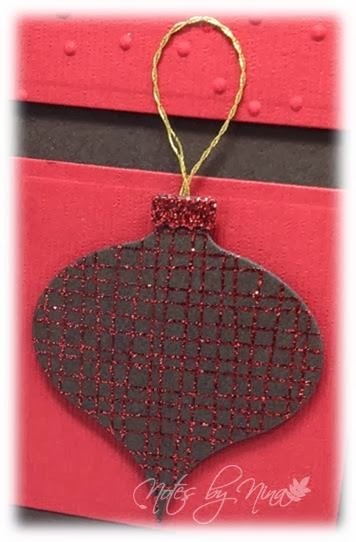 I used a Penny Black background stamp to add a red glitter embossed texture to the ornament I created using a Memory Box die. I used the same embossing powder for the top of the ornament and popped the ornament up with foam tape and then finished with some gold twine. Supplies: Cream, red and brown card stock, Papertrey Ink - Holiday Wishes, Penny Black-Warm Wishes, Spellbinders and Memory Box die cuts, embossing folder, twine. 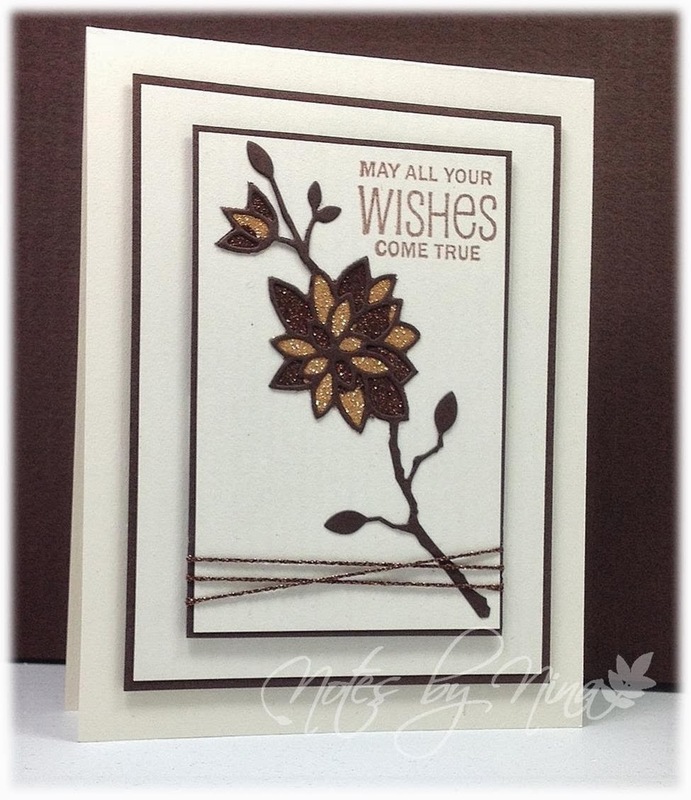 Stop by the Merry Monday Christmas Card Challenge blog to see all the lovely design team creations. We have had two days of heavy socked in type fog here on the Island, I have no excuse that I did not craft one bit this weekend. I created this card off and on last week and wanted to do a quick post. This card turned my little craft area in to a glitter festival, I think I tested the limits of the special glitter clean up cloth. I used a die cut for the flower backed the with two sided glue tape so I could add the brown and gold glitter. I added a sentiment and twine to finish. 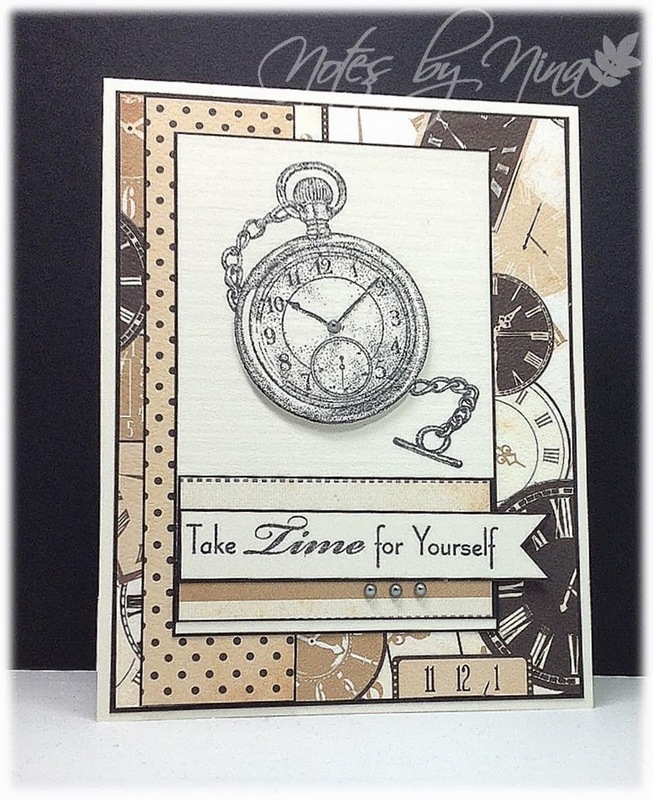 Supplies: Cream and brown cardstock, Memory Box die cut, misc – sentiment, glitter, twine. This card is for the current Freshly Made Sketches Challenge and I chose to make a Valentine’s Card. I heat embossed the hearts and fussy cut them out, I popped then all up with foam tape and then I added an additional sentiment along the bottom. Supplies: Cream and black card stock, Designer Paper – Quick Quotes Paper, The Stamps of Life – hearts2diefor. 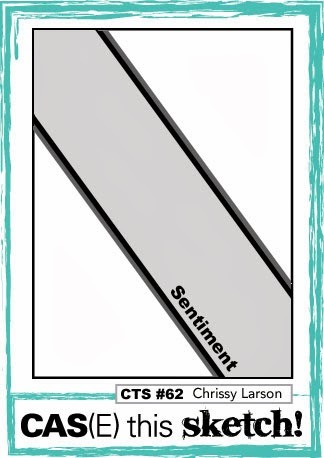 I have a masculine card for the current Tuesday Morning Sketches challenge. I turned the sketch and added a few twists :), I used a couple of eyelets to string my twine under rather than over, I created a larger sentiment and framed it and finished with some pearls. 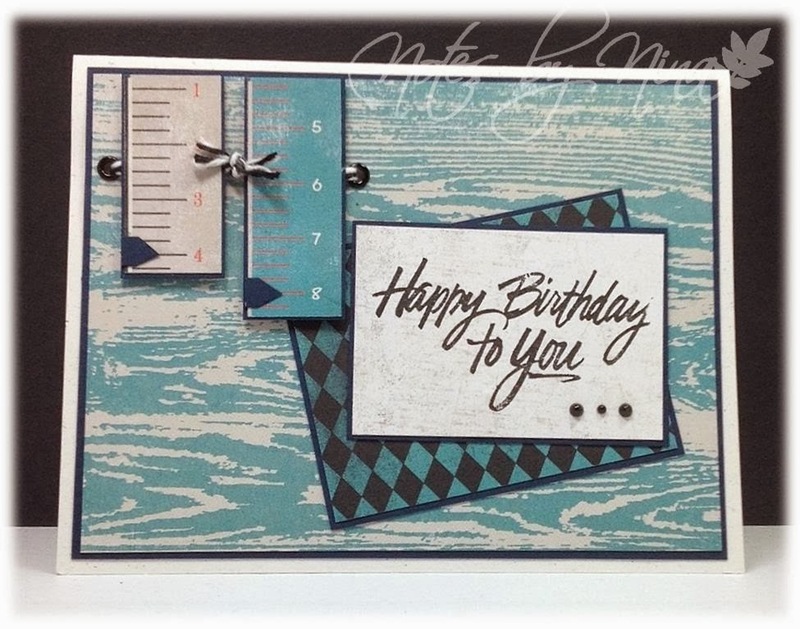 Supplies: Natural white and navy card stock, Designer Paper – Authentique, Denami Design-Happy Birthday, twine, eyelets and pearls. It is time for a new Merry Monday Challenge. Take a look at this wonderful inspiration photo, this week we are challenging you with colours. 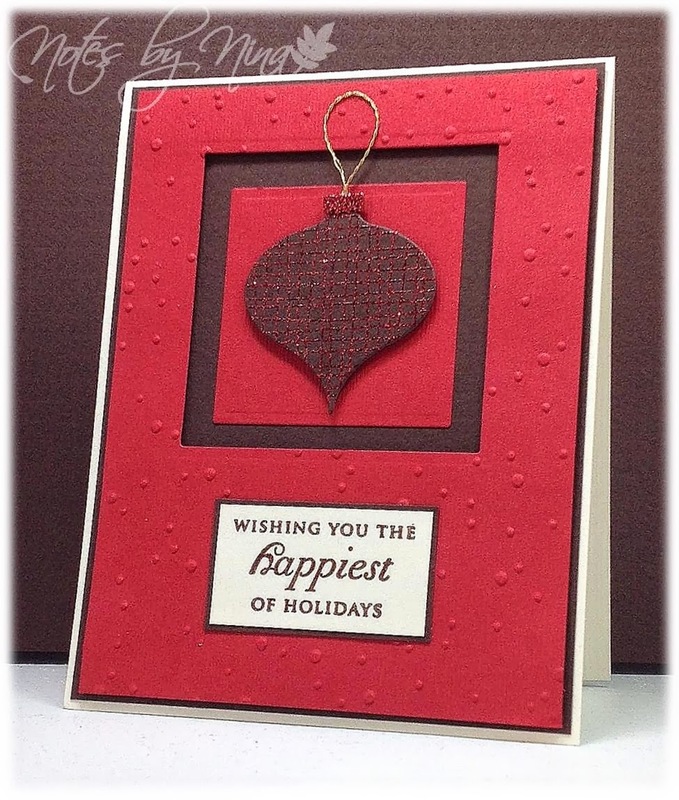 I used a cream or vanilla card stock for my card base, then added layers of red and kraft. 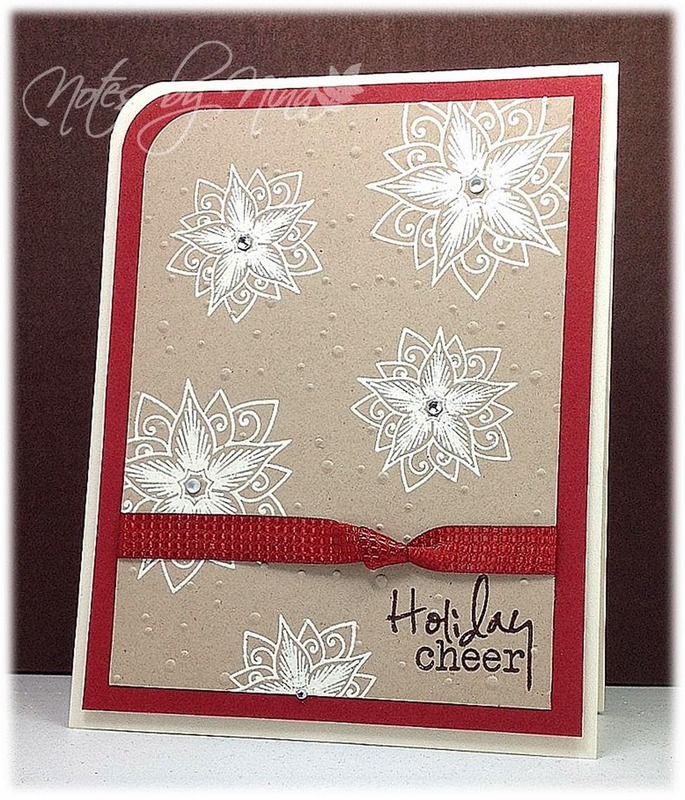 I heat embossed the poinsettia in a white/silver embossing powder and I even added a little background texture. I finished with some knotted ribbon, some gems and a sentiment in brown. 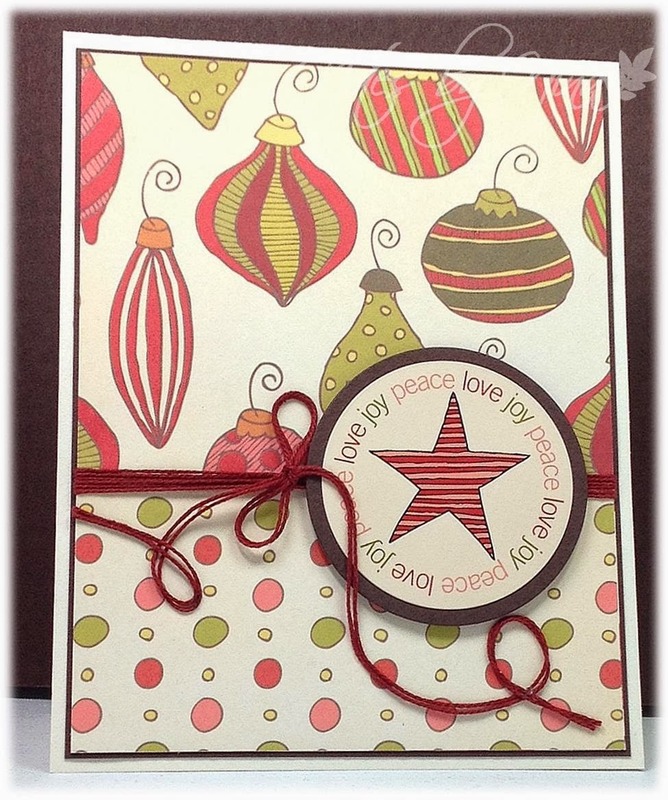 Stop by the Merry Monday Christmas Card Challenge blog to see all the fabulous design team creations. The sun is gorgeous outside my window and it is calling for me to head out for a walk. I wanted to get a card in first this though. I am joining in the fun for the current Fusion Card Challenge. I added some wood grain texture to the flourish and I think I even managed all the colours, layers, foam tape and twine are the words of the day. 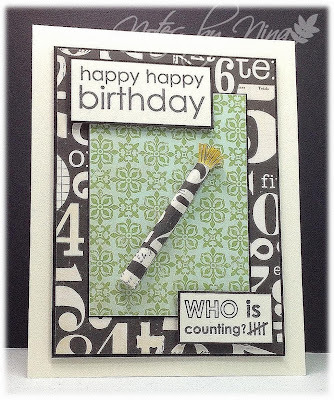 Supplies: White and black card stock, Designer Paper – My Mind’s Eye, Verve-Birthday to You, Inspired by Stamping die cut, MTF - Leaf Flourish, twine. I had way more fun creating this card then I thought I would, when I was a kid I loved to colour. As an adult it is like it is a lost art to me, I can never shadow or blend colours as I want them too. I love how this card turned out though. 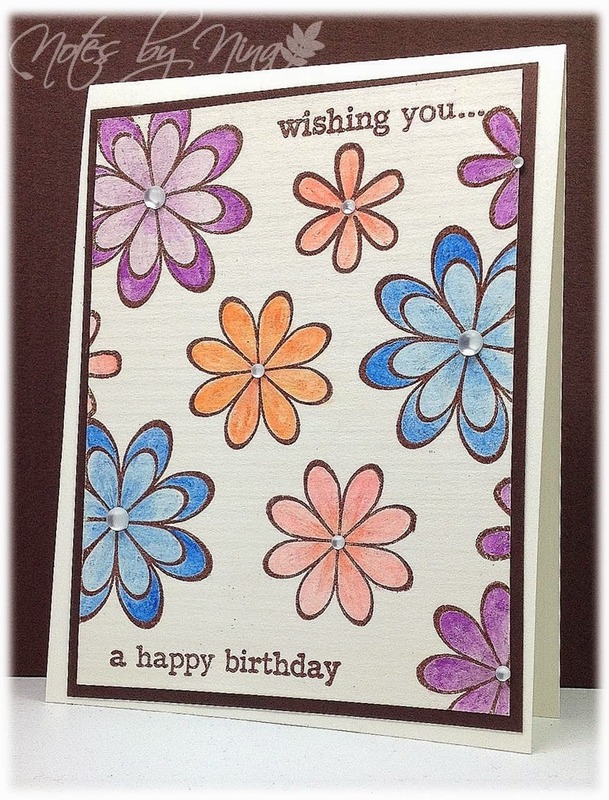 This card is for the current Seize the Birthday where the challenge is to create a Birthday card with colouring. 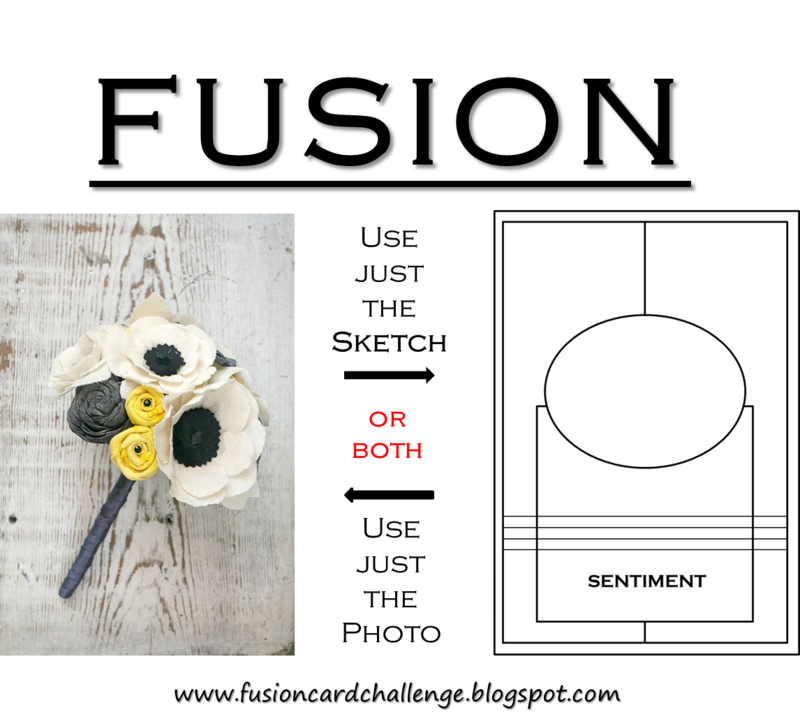 I used s simple layer, and then heat embossed the sentiments and the flowers. I coloured the flowers with my watercolour pencils and added a little clear glitter pen and finished with some gems. 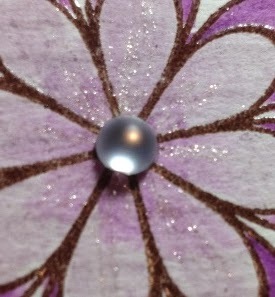 I took this smaller picture to show the glitter as it does not really show on the card picture. 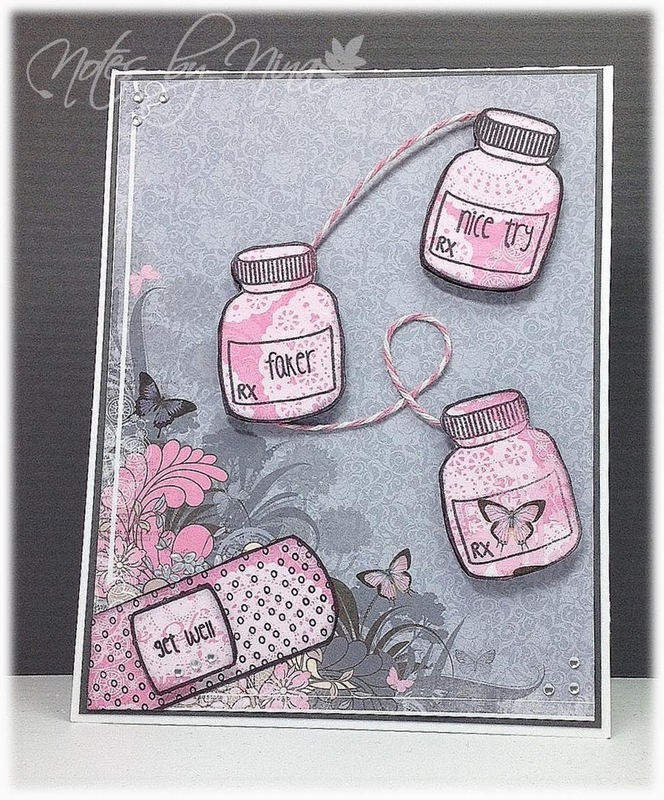 Supplies: Cream and brown card stock, The stamps of Life – daisies2garden and creations2fill, Derwent-Watercolour, gems. Good Morning and happy Thursday, we have almost made it to the end of the work week – well for me anyway. 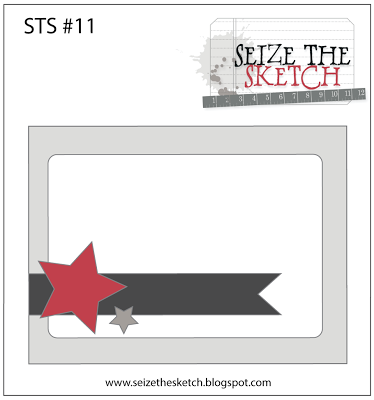 This post is for Seize the Sketch Challenge, I went with a CAS card. 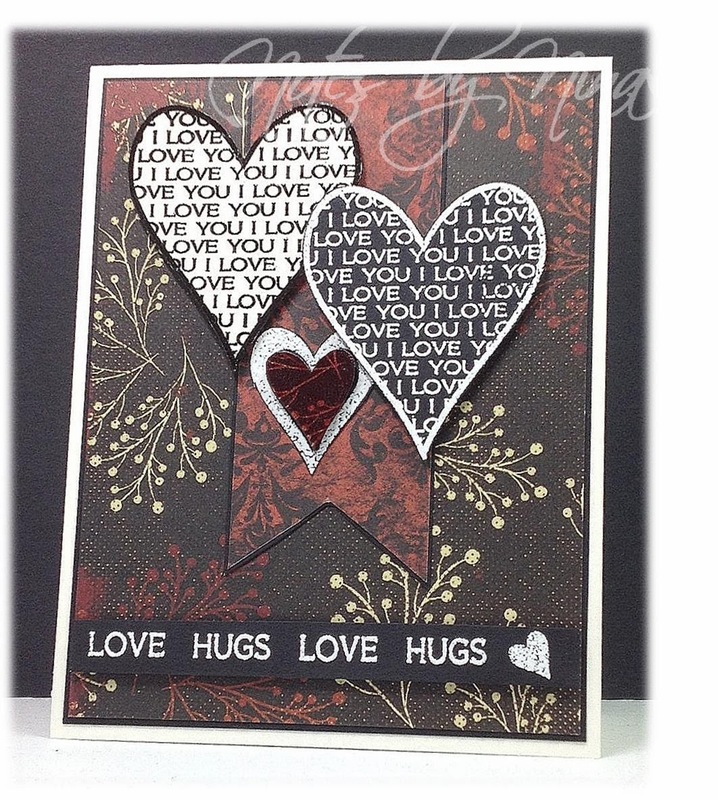 I used the base layer and designer paper, I then layered the hearts and sentiment. 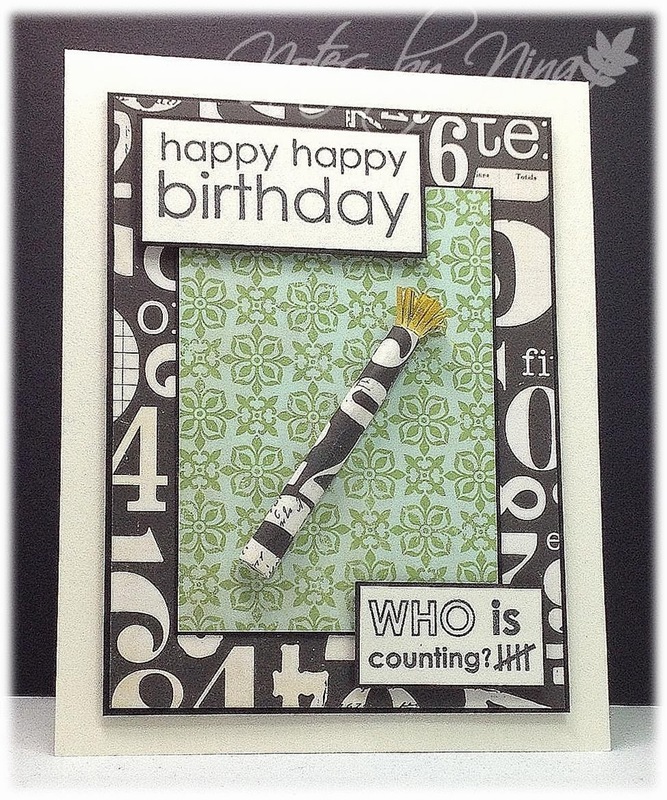 Supplies: Cream and gray card stock, Designer Paper – My Mind’s Eye, Stampabilities – Card Phrases Sizzix - Embosslits. A quick second post, no challenge - just me needing a second Get Well card for a friend who had an accident. I seem to like connecting items with twine like balloons J, these prescription bottles called for double layers and foam tape. I fussy cut a Band-Aid but then cut off a section to fit a corner. I finished with sentiments and gems. 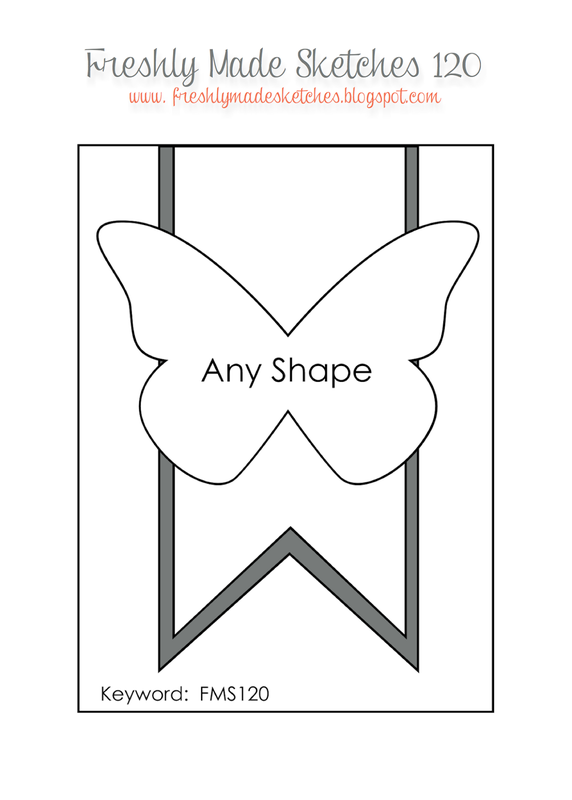 Supplies: Natural white and gray card stock, Designer Paper – Bo Bunny, The Alley Way Stamps - Gotta Bug and Cover Ups. Wednesday already, this week is flying on by. 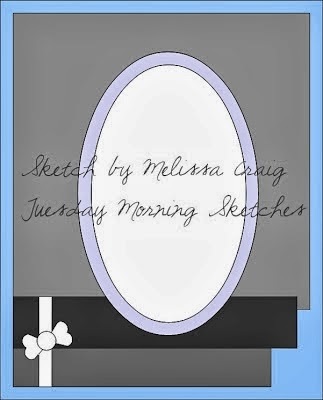 This post is really short but I have a card for the current Tuesday Morning Sketches. 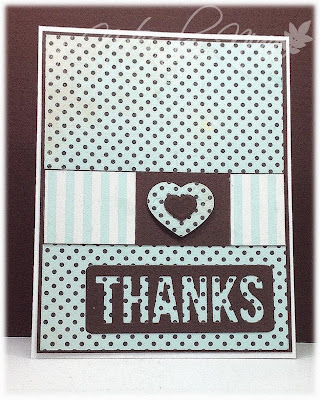 Layers, fussy cutting and foam tape for this fun card and I love the sentiments from these stamps sets. 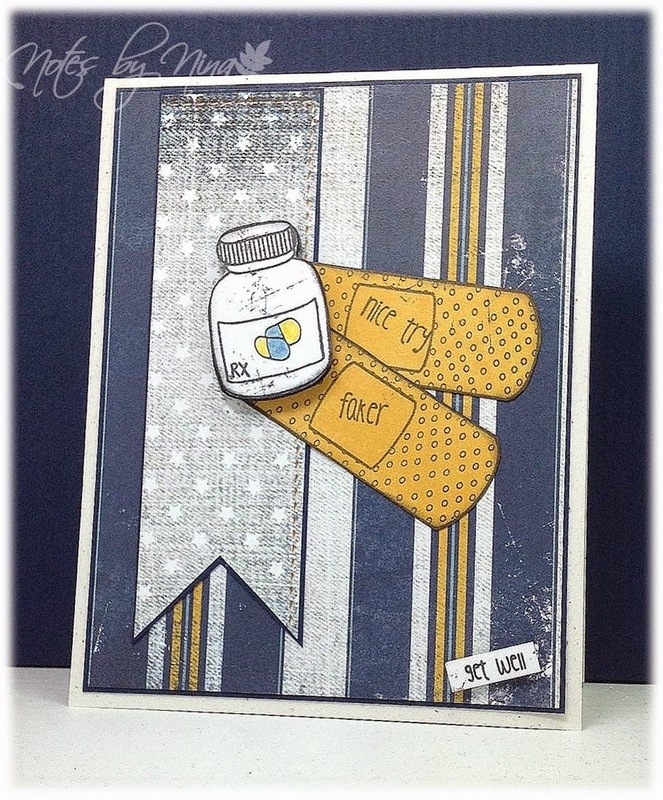 Supplies: Natural white and blue card stock, Designer Paper – Authentique, The Alley Way Stamps – Gotta Bug and Cover Ups. Happy Monday, it is time for a new Merry Monday Challenge. 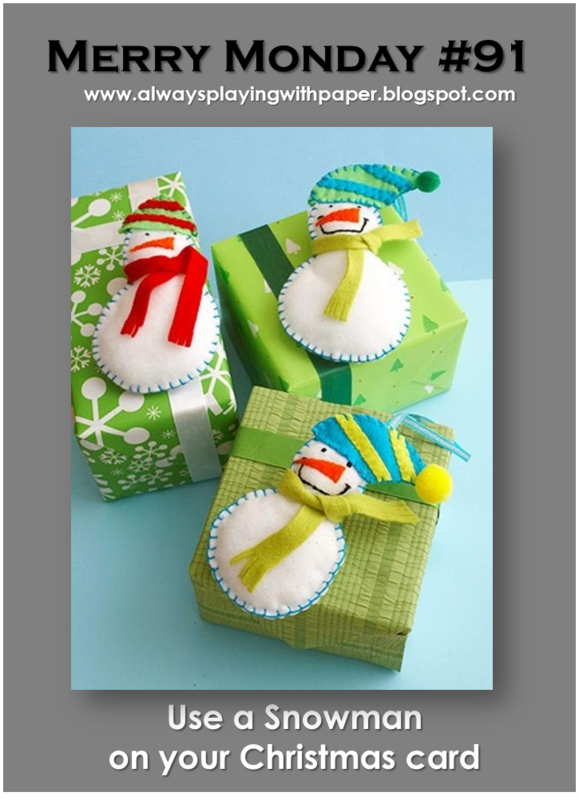 Take a peek at this fabulous inspiration photo, this week we are challenging you to use a snowman on your card. I created a little winter scene with my card and the snowman is multi-layered. I Pearlescent Watercolours for the snow and a clear glitter pen to add some shimmer to the snowman. I used the white and navy to try to make my card look like a picture in a frame and I even added some texture for falling snow. The snowman is 2 layers and popped up with foam take, the center panel is all so popped up. 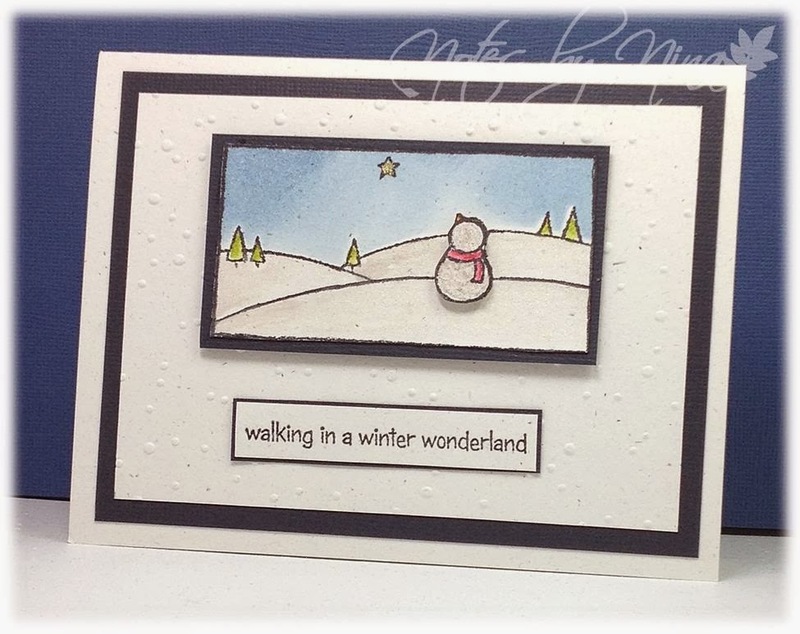 Supplies: White and navy card stock, Penny Black – White Christmas, Pearlescent Watercolours, embossing folder. 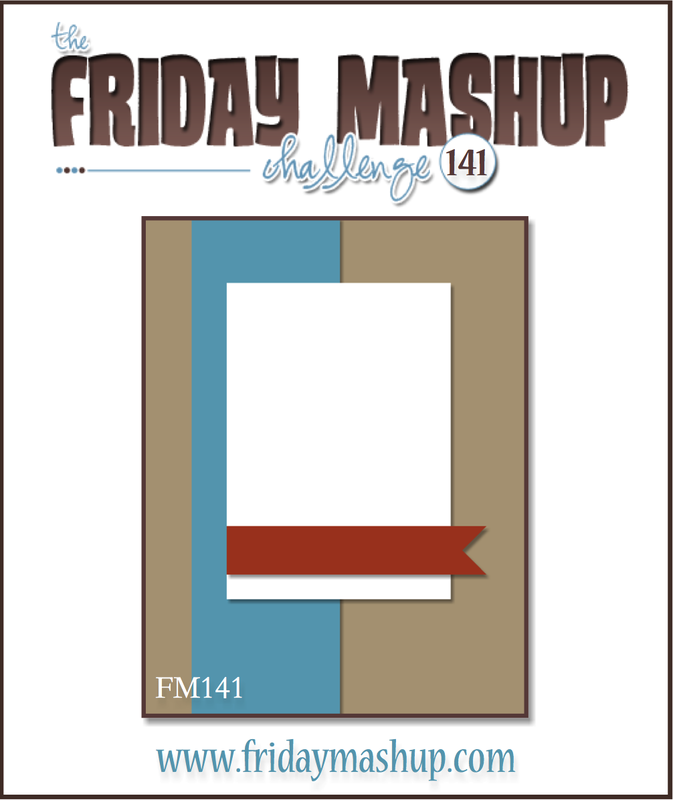 I have a quick second post for the day for the current Friday Mashup challenge. 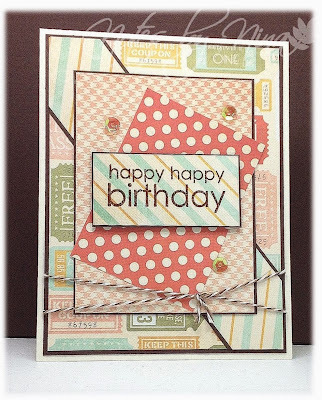 Supplies: Cream and brown card stock, Designer Paper – Fancy Pants, Papertrey Ink – Birthday Bash and The Alley Way Stamps – Wish Big, twine. Happy Saturday, I am cozy and snug with my craft supplies and I hope to get a few cards created today. The first card of the day is for the current TAWS challenge. I used simple layers and then created a cup with parts of the cup being 3 layers deep and popped up with foam tape. I added a little glitter for the finish. 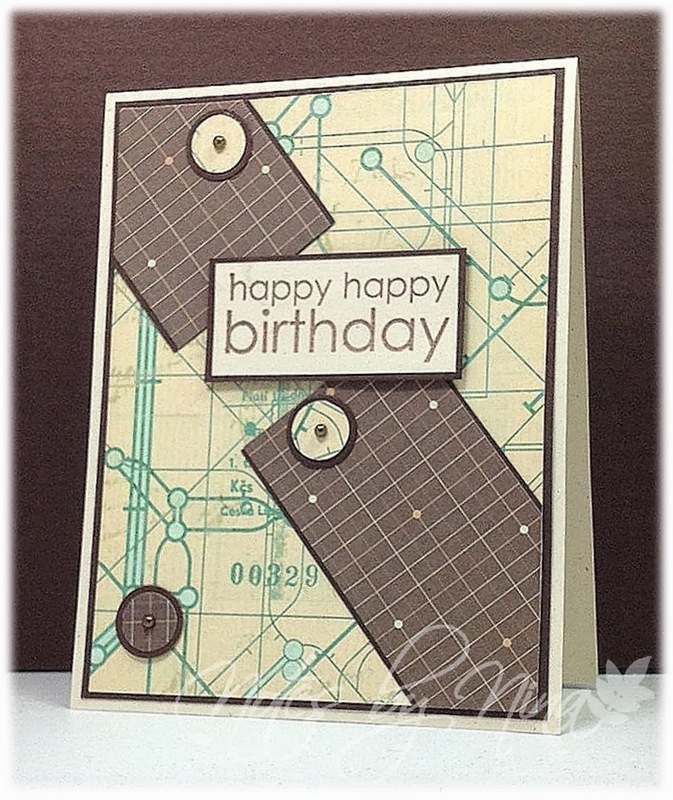 Supplies: White and brown card stock, Designer Paper – Authentique, The Alley Way Stamps – Wish Big and Breakfast Club. 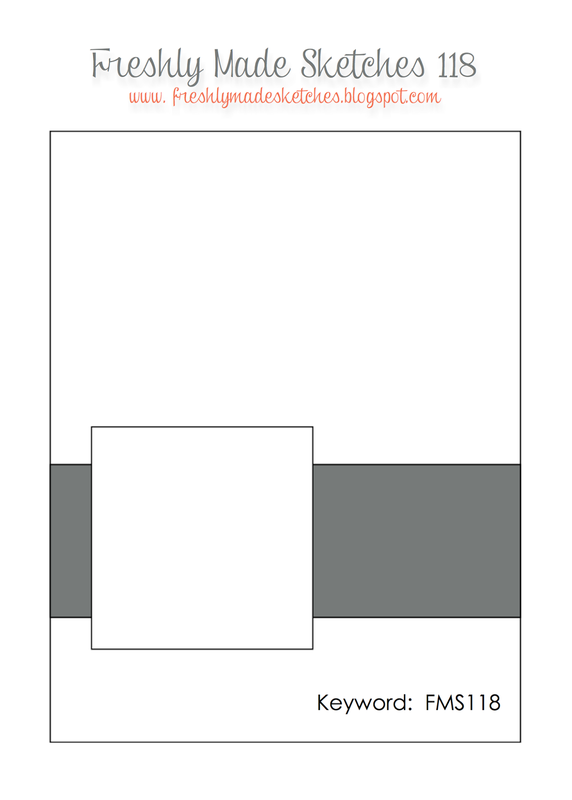 All my posts seem to be short and simple these days, tonight it is for the new card challenge Card Concept and I chose Clean and Layering for my card. 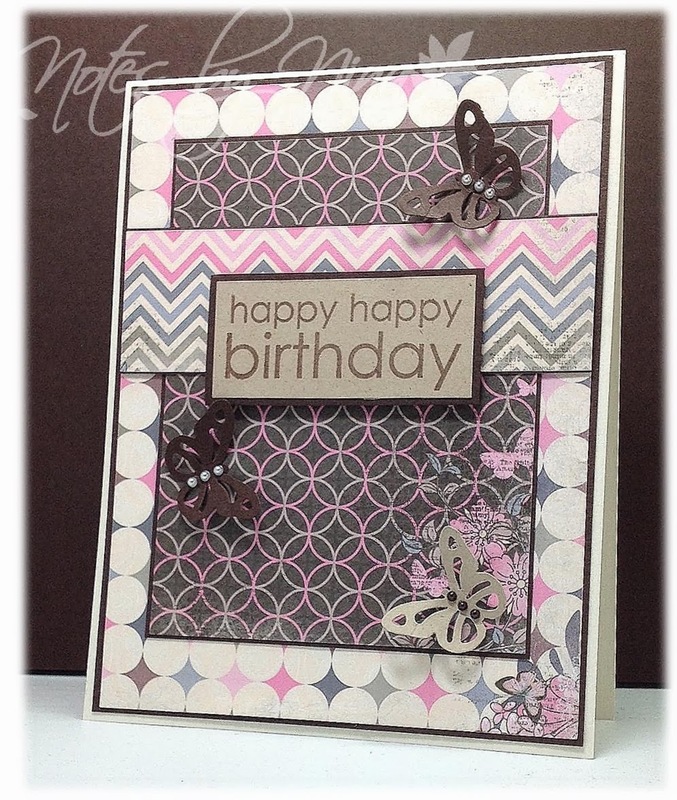 My designer paper incorporates all the colours of vanilla, pink and brown and even some kraft and I added some kraft with my sentiment and butterfly and my layering is a dark brown. I also added some cream and brown pearls to the butterflies. 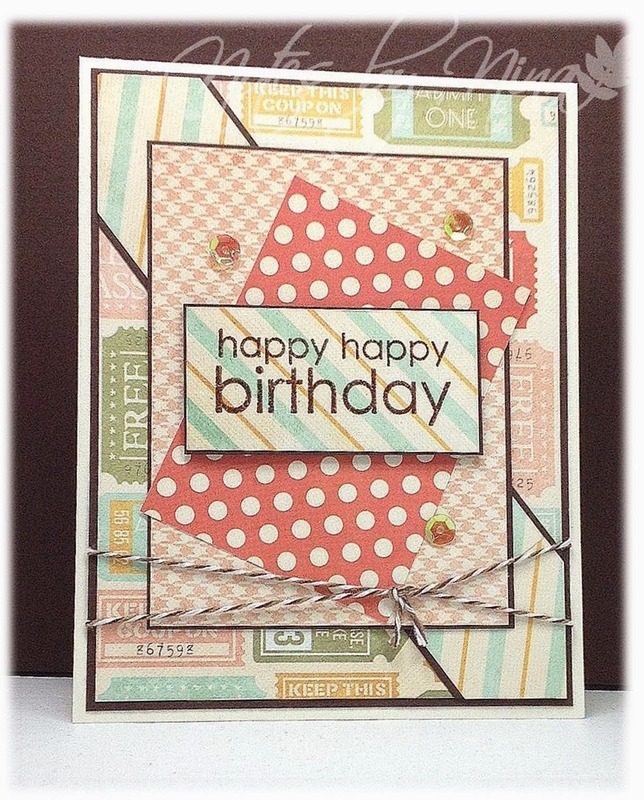 Supplies: Cream and brown card stock, Designer Paper – Bo Bunny, Papertrey Ink – Birthday Bash, butterfly punch and pearls. It is blustery outside my window; it makes me grateful to be inside in my crafty space. I made this card for the current Freshly Made Sketches. I tried my hand at heat embossing on vellum, I added a die cut flourish in behind it. I stamped the sentiment in black and I even added a little bit of glossy accents to the glittery heart. 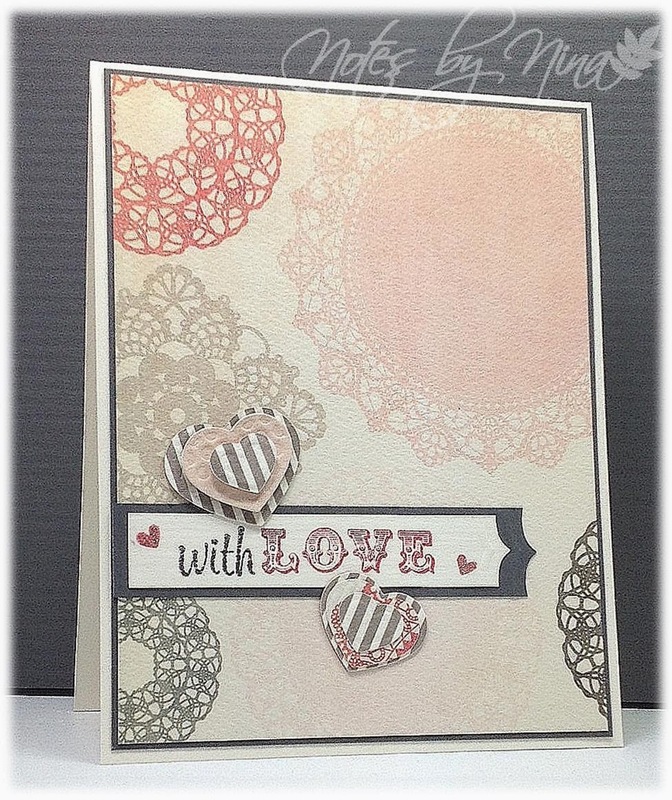 Supplies: White and gray cardstock, Designer Paper – My Mind’s Eye, Inspired by Stamping – Hearts. Howdy Howdy, I have a short post for tonight for the current Tuesday Morning Sketches Challenge. I do like me some layers so that is what I have created; I inked a few edges and added some sequins I was even a little rebellious and added some sparkly twine. Supplies: Cream and brown card stock, Designer Paper – My Mind’s Eye, My Favorite Things-On the Line, sequins and twine. 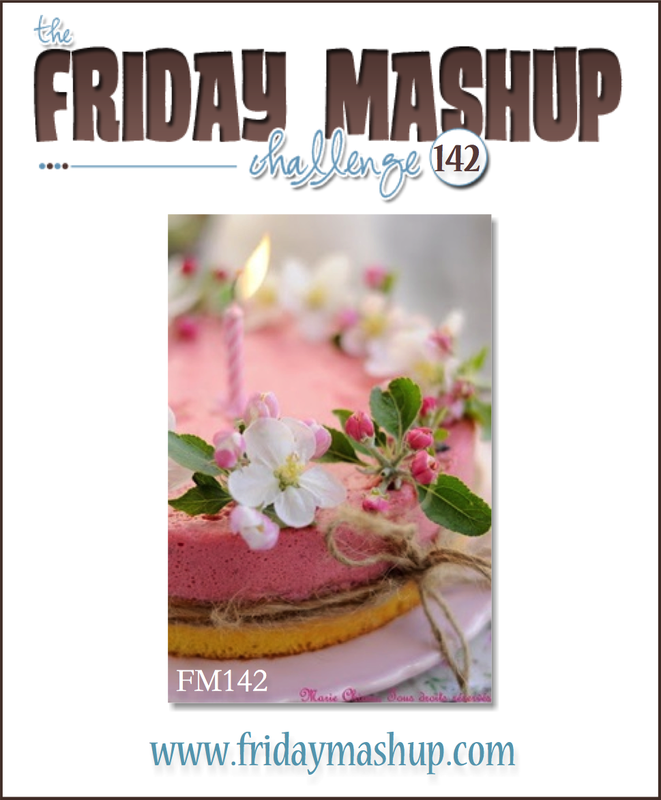 I am so excited, it is the first Monday of 2014 and that of course means a brand new Merry Monday Challenge… but wait, we also have a brand new Merry Monday Challenge Blog site that is just fabulous looking. 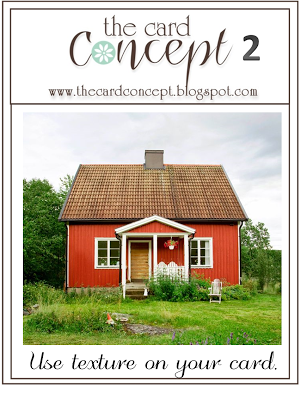 To go with the brand new blog look Lesley has put together inspiration images to help us all along with getting crafty. 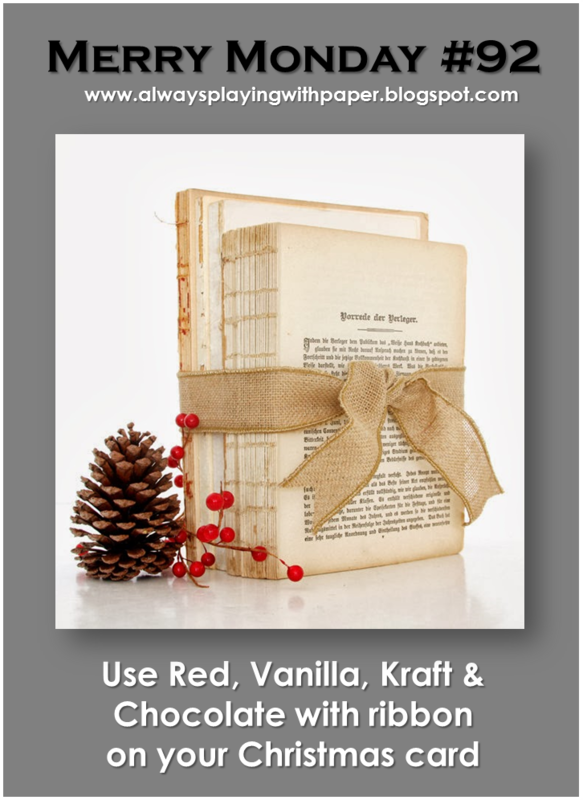 This week the inspiration is… to Use Ribbon or Twine on your Christmas Card. I have so much designer paper in my stash and some is so neglected, so I went digging and found this fun paper by Scenic Route. I went with a CAS card and used simple layers and a sticker that came with the paper pack; I backed it with a layer of brown cardstock. Where I had the fun was making the twine twist and turn. Supplies: Cream and brown card stock, Designer Paper - Scenic Route, twine. 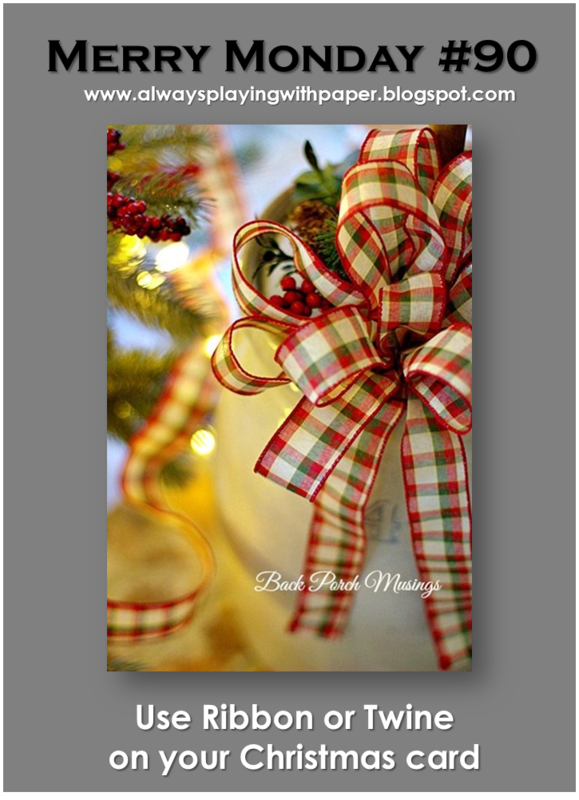 The Merry Monday team has been introduced, stop by the Merry Monday Christmas Card Challenge blog to see all the fabulous samples they have created. Be sure to visit their blogs and leave a little comment love, and don’t forget it is never to early to start your Christmas cards so join in the fun. Brr it is frosty outside my windows this morning, it looks like it is going to be a pretty and sunny day though. 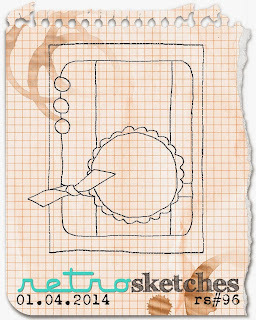 I have a quick post for the current Retro Sketches Challenge. I was initially going to make this a CAS card and let the DP do all the work, however I found a scrap heart on my desk then the satin ribbon made the card a little more elegant so I switched from buttons to sequins and then I finished with script like sentiments. I used foam tape to pop up the heart and the primary sentiment. I have had a few wonderful crafty days and I am loving it, this post is for a card for the current Friday Mashup Challenge. I used lots of layers and a black base for each layer to add dimension. I fussy cut the clock and popped one layer up with foam tape and I finished with the sentiment and pearls. 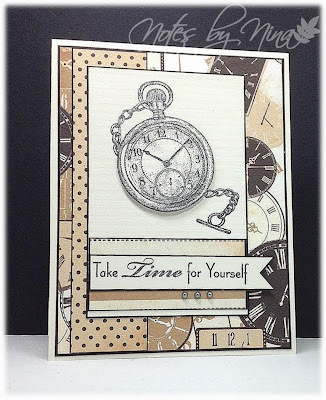 Supplies: Cream and black cardstock, Designer Paper – Bazzill Basics, My Favorite Things-Inspired by Time, Recollections pearls. 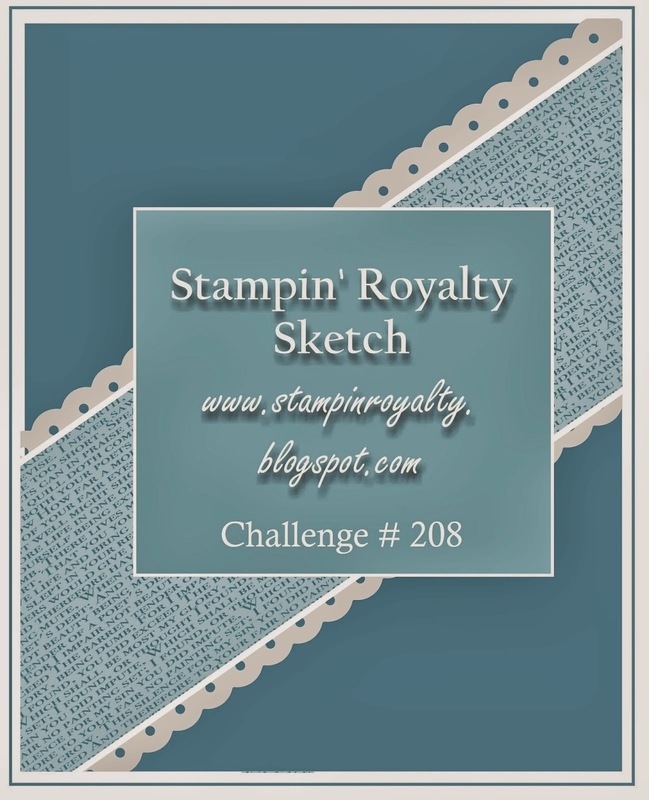 I had good intentions when I started to build my card for the current Stamping Royalty Challenge but then my DP scraps fell all over my card and I could not choose which ones to use and well…. The sketches is there, under a couple extra layers, sequins and twine :), I flipped it only because I glued it backwards... I guess what I am saying it is great that this card even got completed. 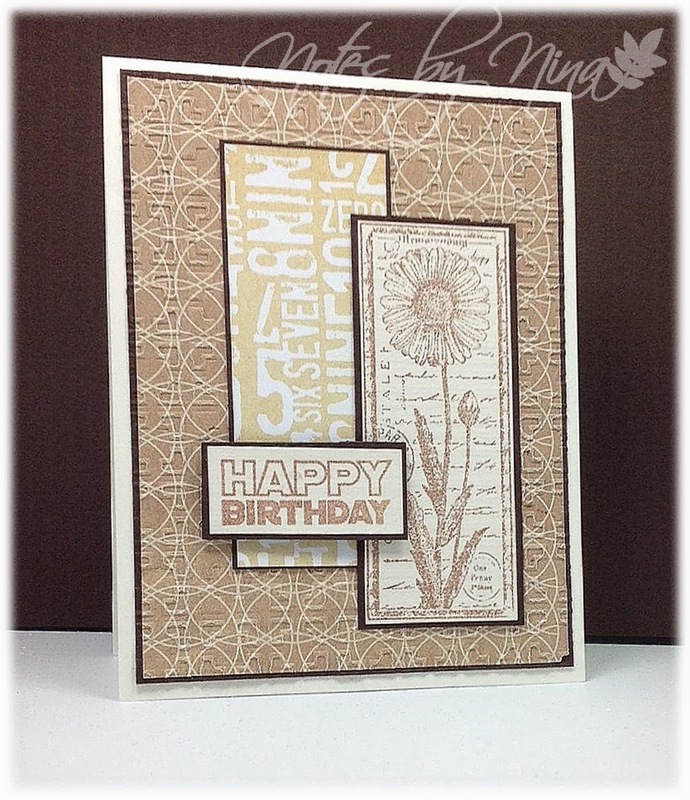 Supplies: Cream and brown cardstock, Designer Paper – Fancy Pants, Papertrey Ink – Birthday Bash, twine and sequins. Birthday firecrackers J well it is supposed to be a candle but.. I think someone with a sense of humour will like it just fine. I am joining the challenge fun for the first challenge of the year with Seize the Birthday; the challenge is to use numbers. I have already made my ‘number’ card for the year, but I have a ton of DP with numbers on it and in truth never really know what to do with it – silly me, I do now. I did some layers, added a few sentiments then finished with a little Bang J. I have seen the rolled paper candles and decided to give it a go. I first tried a couple of strands of yellow twine… dynamite anyone, so then I tried a single piece of twine and it looked a little lost on the card. So then I decided to fringe some paper and used that… hence my firecracker.. I did add some glitter pen for a little sparkle. 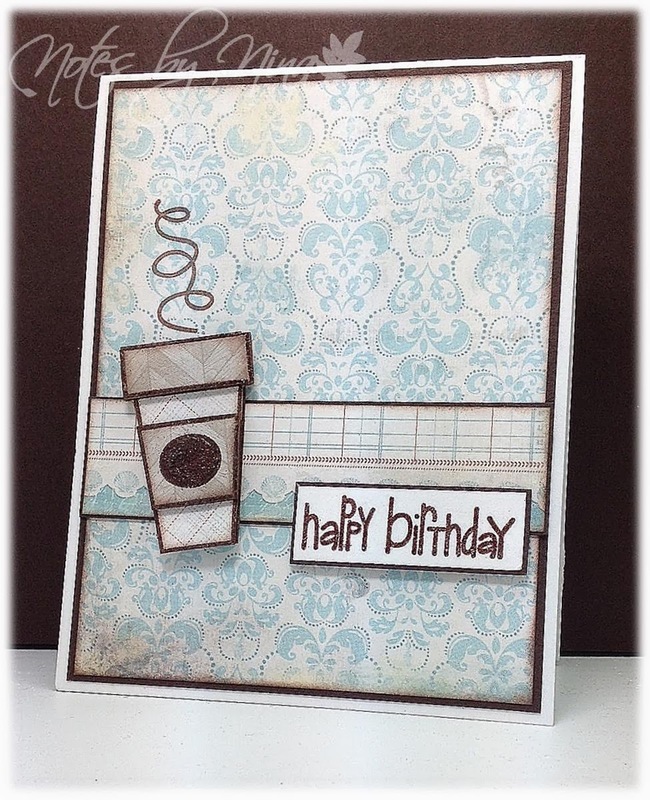 Supplies: Cream and black cardstock, Designer Paper-Echo Park, Papertrey Ink-Birthday Bash. I always need a few Thank you cards at this time of year and I don't imagine I am alone. I had this DP on the side of my desk from the card I made yesterday, so I figured it would work great and when you have enough scraps why not right? I used simple layers, and then used a die cut for the sentiment. I grabbed my Stampin' Up! embosslits for the hearts and popped them up with foam tape. 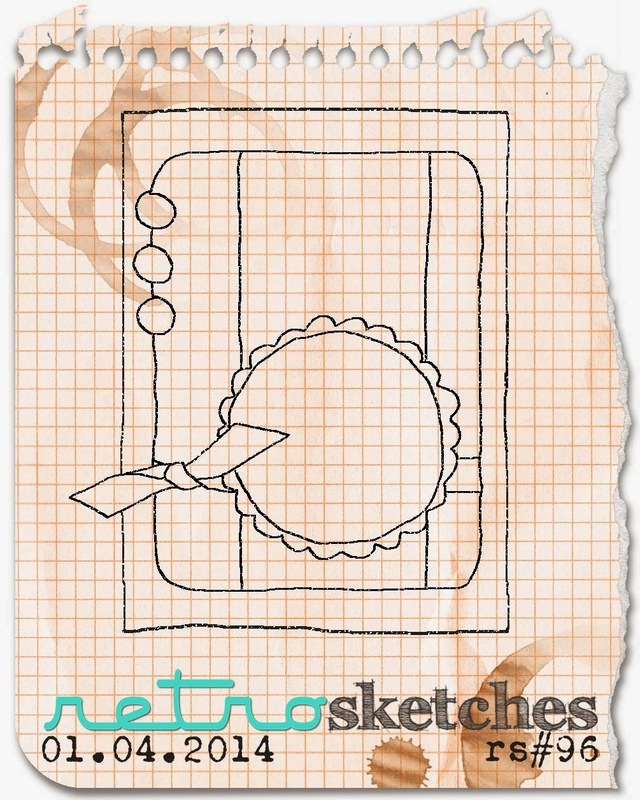 I loosely used this sketch as a template you can find it HERE. I am still debating if I should added some pearls or sequins. 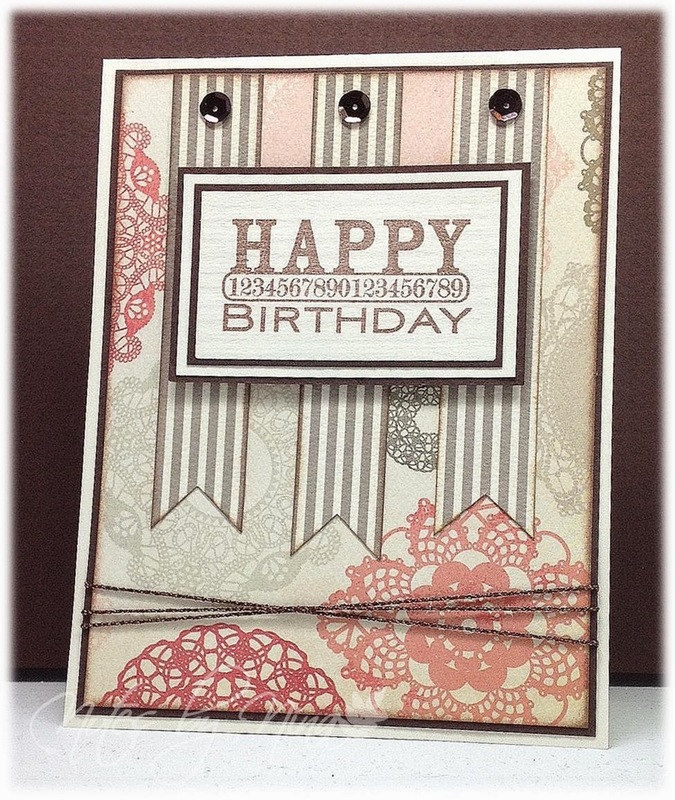 Supplies: White and brown card stock, Designer Paper - Authentique, Avery Elle-Die Cute, Sizzix-Embosslits.